Kent's "Hooligan Libertarian" Blog: Back to Screwel? My appreciation for education explains my opposition to "public" schooling. 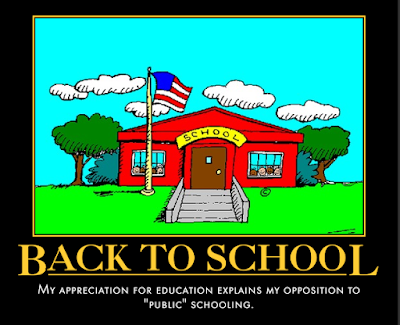 Invariably, someone will point out that they went to "public" school, and got a good education. Just as invariably, the person making this claim is a statist- which is exactly the flaw in their claim. You wouldn't expect to let the Taliban school your child without indoctrinating him, so why is it such a radical observation that when any government controls schooling, the result is a person indoctrinated into statism? Unfortunately, the vast majority of Americans think their children *should* be indoctrinated into statism.